Osteoporosis occurs when more bone is naturally lost than replaced. This results in bones becoming more fragile and therefore breaks more easily. 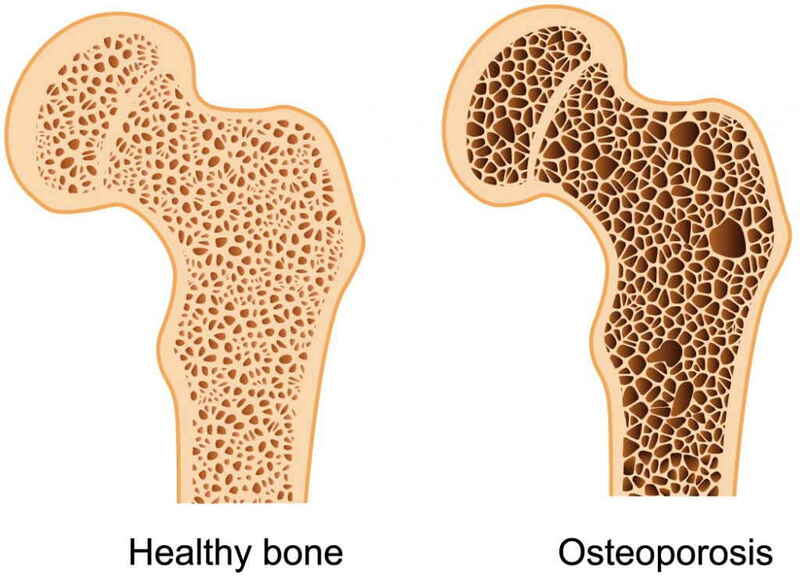 Osteoporosis is when bones are more porous and it affects 1 in 5 men and 1 in 2 women. Often there are no signs or symptoms prior to a person having a broken bone. A DXA scan of your spine and hips is the best method for diagnosing osteoporosis and is highly recommended if you are at risk. Ensure to take the daily-recommended amount of Calcium and Vitamin D3, essential nutrients for both the prevention and treatment of osteoporosis. Calcium is found in foods such as dairy products, bread, nuts, oily fish, and dark green vegetables. Vitamin D3 can be gained from 10-15 minutes of sun exposure a day or foods such as oily fish, dairy products, and foods fortified with Vitamin D.
It is essential that calcium is taken in conjunction with Vitamin D3 as vitamin D3 is required to absorb calcium. Weight-bearing exercise is essential at all ages to maintain and increase bone density and strength. Examples of weight bearing activities include dancing, walking, running, soccer, tennis, soccer, stair climbing, and weight training. There are a range of treatments available from your Haven Pharmacy to help with bone health. Please speak to one of our trained advisers or ask your Haven Pharmacist if you would like advice on which treatment is best suited to your needs. https://havenpharmacy.ie/wp-content/uploads/2018/05/osteoperosis.jpg 740 1024 Karen O'Neill https://havenpharmacy.ie/wp-content/uploads/2018/08/horizlogo-1030x163.png Karen O'Neill2018-01-30 15:50:592018-08-09 16:15:23What is Osteoporosis?